Hosting, Spokesperson, Actor and Educator- all things Dave Thomas, the TV teacher! 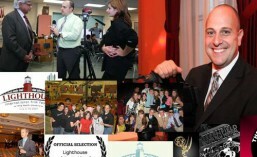 For nearly a decade, I have had the honor of being involved with the Greenfield Youth Film Festival. From the first year, as one of the first mentors, I knew we were on to something special. All these years later, the program only continues to grow and we have enjoyed watching our former high school filmmakers develop through their college years and now into industry leaders and professionals. These days, I cherish the distinct role of being the Educational Coordinator for the festival, MY primary role is to ensure that the hundreds of students involved in this festival receive the most relevant and valuable education in the world of film-making every year. This enables me to collaborate with some of the finest people in the industry and as I always say, “it’s all about the kids.” So, when we choose these professionals to present to our young filmmakers, it’s only because in addition to being amazing at their jobs, they also know and understand how to nurture the future of our industry. Please check out the “my network” tab to meet many of these amazing people who are now also great contacts for any student I teach.